Captain’s Quarters Resort has been named the number one Kid-Friendly Hotel in Myrtle Beach! Oyster.com, a world-wide hotel review and research web site, listed the top 4 Kid-Friendly Hotels in Myrtle Beach and Captain’s Quarters Resort took the top spot. “All of Vacation Myrtle Beach’s resorts strive to be great places for families to vacation. We’re proud that Captain’s Quarters was recognized by Oyster.com for its efforts,” said Matt Klugman of Vacation Myrtle Beach. Oyster cited Captain’s Quarters Level 6 Entertainment Center, with a full game room and 20-lane bowling alley as one of the many reasons for its #1 spot. Also cited were the “massive waterpark complex” which encompasses the outdoor pools, whirlpools and the Kids’ Shipwreck Lagoon waterpark as well as the resort’s kid-friendly dining. What set Captain’s Quarters Resort apart was the fact that it offers such a wide range of things to do for kids during the summer, which is “relatively unheard of in Myrtle Beach,” according to the site. “Everyone at Captain’s Quarters works hard to make every Myrtle Beach Vacationers trip a wonderful time with family that will make memories that last a lifetime,” said Klugman. Summer activities often include arts and crafts, a family-friendly glow party, Salty’s dance party, poolside fire show, games and so much more. View our events here. Since winning the accolade, Captain’s Quarters has expanded its family-friendly stance by taking on the role of the Friendliest Place on the Beach through a program that encompasses every employee at the resort. From housekeeping, to maintenance, to the front desk agents, all employees are trained and ready to help make all guests feel welcome, appreciated and to help them have the best vacation ever. They are trained to be kind to the entire family, including the kids! You may hear an employee telling jokes, saying hi in the hallway or giving the kids high-fives during your vacation at Captain’s Quarters Resort. Kids will always feel included and important! 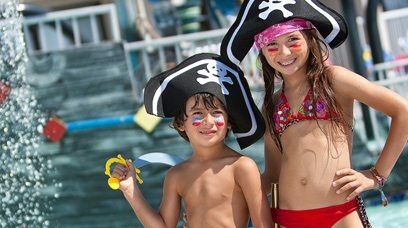 We invite you to stay at our resort to see first-hand these top reasons why kids love Captain’s Quarters Resort. Learn more about our hotel deals in Myrtle Beach and start planning your affordable Myrtle Beach vacation today!